Instilling proper dental habits in your children early on can help make it easier for them to care for their teeth lifelong. After all, good practices can’t start too soon! For example, you can use gauze to wipe your baby’s gums and clean any plaque from newly sprouting teeth. In addition, use a soft toothbrush to clean teeth when they are fully erupted. And flossing? Kids don’t get a free pass! 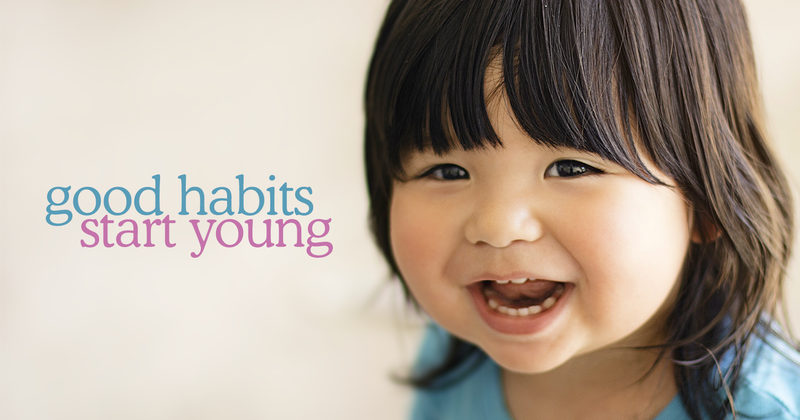 You can start the habit of flossing once your child has all of his or her primary teeth, generally by age two. It’s also during this time that you should take your child for their first dental visit. Ask your dentist and doctor about fluoride rinses or toothpastes, as they can prevent tooth decay. But here’s what’s most important about that first visit: make it fun, comfortable, and easy. Now is the time to dispel any fears about the dentist! Creating fond memories from these early visits can ensure that your child doesn’t come to fear the dentist. When your child begins to develop permanent teeth, consider sealants. Sealants in molars can keep cavities from forming in these chewing-heavy areas. It protects the enamel and keeps away tooth decay-causing bacteria. If your child begins to play sports, don’t forget about protecting their teeth too! Mouth guards are essential for high-activity sports like football. They can prevent broken teeth, broken jaws, saving you a lot of difficulty and money. You can get a custom-designed mouth guard to make sure your child’s teeth and jaw are fully protected from any sports-related collisions! In general, make sure your kids are involved with taking care of their teeth—make brushing teeth a fun activity that you do together as a family. Develop a relationship with your dental care team so that your child trusts and feels comfortable in the dentist’s chair. Healthy habits start young!